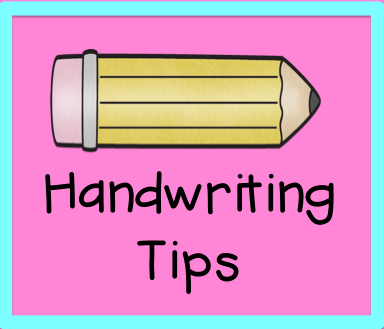 Do you have students with messy handwriting? Sometimes this is due to fine motor skills. But, it can be a symptom of other problems. Don’t assume this is a case of if-only-he/she-slowed-down syndrome. Slowing down doesn’t always fix illegible handwriting. If you have a Messy Marvin or Messy Maggie this year, try a few of these tips to see if one of them might help. Wrap a rubberband around a pencil where you grip the pencil. This will show your student the correct place to hold the pencil. Some student hold the pencil too close to the point or too far away. It also helps them hold onto the pencil if they use a light grasp. The pin says this handy dandy tool can be used to make raised line paper. This tool is usually used by a seamstress. Since this pin goes nowhere, I decided to test it out because I love the idea. Raised line paper is a great tool to use with students with messy handwriting, but it is very expensive. I visited my local fabric store and purchased a serrated tracing wheel for $2.49. You can buy one with a smooth edge and a serrated edge. I bought the serrated one. You are going to roll the tracing wheel on THE BACK of the paper. You can either copy your handwriting paper on both sides of your paper or you can draw dots like I did in the picture. The dots show me where the lines are on the front side of the paper. This is where I need to place my ruler. Line up your ruler with the dots or the lines of the paper. Roll your tracing wheel back and forth next to the ruler. If you look closely you can see the bumpy texture that the tracing wheel made on my paper. I’m sure parent volunteer or students from an older grade would be willing to make these for your students. One of the nice things about this paper is it is discreet. You can hang an assignment done on this paper next to an assignment done on regular paper and very few people would notice. Here are some articles and handouts that will give you more information and strategies that you can use with your students. I found a site that many different types of handwriting papers that you can download for FREE! Click HERE to visit this amazing site. Unbelievably cool! Thank you for a wonderful tip! Thanks so much for sharing ! It seems like every year I get more messy maggies and marvins that hold their pencil incorrectlyand ignore the lines . I'm going to give this a whirl . Our OT also recommends placing the child paper on top of a three ring binder to pull their wrist up. Some kids I subbed for today could have sure used some of these lol. Thanks for the free handwriting paper!